What part of the world are tawny owls found? Tawny Owls are found throughout Europe and North Africa, including Morocco, Tunisia, Algeria, and eastwards to Iran and western Siberia. Their range in Asia covers western India, the Himalayas, southern China, Korea and Taiwan. In Europe the Tawny owl is the most common and most widespread owl, being absent only in Ireland, the extreme north of Scotland, northern Russia, northern Scandinavia, Iceland and some of the Mediterranean islands. What type of habitat do tawny owls prefer? Woodlands are their preferred habitat, but they are adaptable and have even taken up residence in cities such as London and Berlin where there are large wooded parks and gardens. Tawny Owls usually mate in broadleaved woodland forests and open parklands, although occasionally they inhabit coniferous forests. How do tawny owls hunt and what do they like to eat? Tawny Owls hunt almost exclusively at night, usually waiting quietly on a perch, watching and listening for prey. After detecting a prey animal moving about, the owl glides down or drops onto it and, at the moment of impact, extends its wings to cover it, which is usually killed immediately with the powerful feet and claws. Prey taken includes rabbits, moles, mice and other rodents, shrews, voles, and other birds. Tawny Owls will sometimes take birds, and occasionally bats, from their roosting perches. They will even take incubating birds, such as blackbirds, woodcocks and pigeons, by picking them off their nests. How big are tawny owls? Males usually reach a length of 16 to 17 inches with a wingspan of about 35 to 37 inches and weigh about 14 to 19 ounces. Females are slightly larger, usually reaching a length of about 17 to 18 inches with a wingspan of 37 to 41 inches and a weight of 14 to 28 ounces. What is the lifespan of tawny owls? In central Europe, one tawny owl lived 18 years and 7 months and in Britain one captive tawny owl lived to be 27 years. Many young tawny owls lose their lives when trying to secure a territory inside the parental one – they either starve or move out. The most common fatalities connected with humans are collisions with vehicles, trains or wires, and getting trapped in buildings. Do tawny owls maintain a home range? Tawny owls maintain a territory size that depends on terrain and prey availability. Territories may range from 12 hactares (30 acres) in closed woodland, through 65-75 hactares (162.5-187.5 acres) when living in areas with lesser amounts of vegetation, to 102 hactares (255 acres) in Norway, where the prey density is far less than in England or Belgium. The tawny owl defends its territory vigorously against neighbors with ‘song’, or with threatening behaviors or in flying skirmishes. Predatory mammals, too, such as cats, foxes and dogs, are driven from the vicinity of the nest. Occasionally a tawny owl female with nestlings may attack a human approaching the nest, even in daylight, and may even draw blood with its talons. In Britain at least two people are known to have lost an eye from attacks. Eric Hosking, a famous bird photographer, had this happen to him quite early in his career. 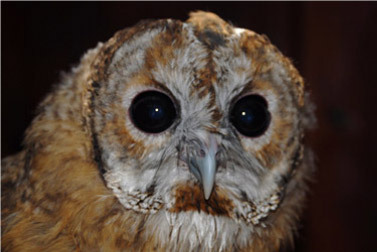 What type of communication and perception do tawny owls rely on? The familiar hooting of the male tawny owl has several functions: it is a territorial call, a courtship call, and an announcing call used when bringing food to the female. It consists of a long drawn out hooo, a pause, an abrupt and subdued ha, usually followed at once by a prolonged and resonant final wavering phrase huhuhuhooo. Sometimes, the female makes a similar hooting sound to the mating male, however, the female’s hooting is less clearly phrased than the male’s, the last phrase having a more wailing quality, approximately wow-wow-hooo, sometimes described as a grating, hoarse version of the normal song. The contact call kewick and its variants is the most frequent vocalization of the female, but the male also uses it. In spring the female may answer the male’s hoot with kewick as a kind of duet. When the female gives this call from the nest the male generally responds soon afterwards by bringing prey to her, loudly announcing his arrival. The parents also make a similar call as a contact call when bringing prey to the fledged young. The young will answer with their cheeping call. Many other calls have been heard during courtship and in territorial disputes. Piercing coo-wik cries apparently express aggression. How does reproduction occur with tawny owls? Tawny owls pair up and choose nest sites in the autumn. A hole in a mature deciduous tree, such as an oak, is a favorite place, but old nests, or crevices in rocks and buildings may also be used. The male courts the female for several weeks before mating by bringing her food. Sometimes they display by swaying and may also preen each other. A clutch of 2 – 5 white eggs is laid from about March onwards at intervals of up to a week apart. The female incubates the eggs, starting with the first egg, which means that the young hatch at different times and so vary greatly in size. She sits on the chicks while her mate brings food. The incubation period is 28 – 30 days. Both parents feed the young until they are two or three months old although they can fly at about 5 weeks of age. Eventually they are evicted from the nest and find territories of their own. Tawny Owls are dependent on their parents for food up to three months after leaving the nest. Only one brood a year is produced. What interesting adaptations do tawny owls possess? The forward facing aspect of the eyes that give an owl its “wise” appearance, also give it a wide range of “binocular” vision (seeing an object with both eyes at the same time). This means the owl can see objects in 3 dimensions (height, width, and depth), and can judge distances in a similar way to humans. The field of view for an owl is about 110 degrees, with about 70 degrees being binocular vision. 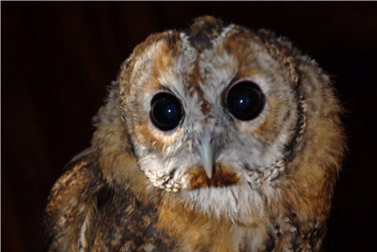 An Owl’s eyes are large in order to improve their efficiency, especially under low light conditions. In fact, the eyes are so well developed, that they are not eye balls per se, but more elongated and tube-like. They are held in place by bony structures in the skull called sclerotic rings. For this reason, an owl cannot “roll” or move its eyes – that is, it can only look straight ahead. To compensate for this, owls are capable of turning their heads around, and almost upside-down. They are able to achieve this by having a long and very flexible neck, which is not always apparent, as it is hidden by feathers and the owl’s posture. An owl’s neck has 14 vertebrae, which is twice as many as humans. This allows the owl to turn its head through a range of 270 degrees measured from a forward facing position. To protect their eyes, owls are equipped with 3 eyelids. 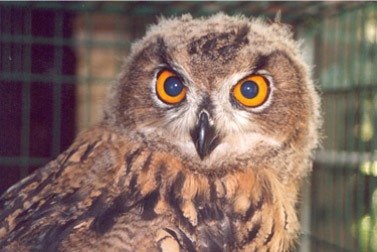 They have a normal upper and lower eyelid, the upper closing when the owl blinks, and the lower closing up when the owl is asleep. The third eyelid is called a nictitating membrane, and is a thin layer of tissue that closes diagonally across the eye, from the inside to the outside. This cleans and protects the surface of the eye. What roles do tawny owls play in their ecosystems? Tawny owls are important predators of rodents and voles. What is the conservation status of tawny owls? Where tawny owls occur they are generally common.